vuAgent from valutilities is an unbelievably simple and easy way to incorporate the Microsoft Agents into your applications (you know, Merlin, Peedy, Genie, Robby, etc. vuAgent from valutilities is an unbelievably simple and easy way to incorporate the Microsoft Agents into your applications (you know, Merlin, Peedy, Genie, Robby, etc.). One function call is all it takes to start using Agents. vuAgent comes with a complete demo that shows you exactly how to use Agents. Great Craps simulation with animated players. If your eyes get tired while reading at your computer and you'd like to have a program for your computer that can read text from a text file or even text from your Windows' clipboard, then FreeVoice could be just what you need. Ahsha Math is a fun interactive, animated math tutor for your children. Ahsha Math is a fun interactive, animated math tutor for your children. It uses animated characters called Microsoft Agents. These Agents have realistic movements and speak in a natural non computer manner. DocBuilder is a professional writing tool for Microsoft Word. User can save often used snippets into library, and get them out when he want to write same kind of words in other files. It's very useful for users who often write similar documents. Email plus Voice is a Microsoft Outlook add-in, that allows to add a voice to the mail message. It has simple and handy interface and enhanced abilities. It works with Outlook 2000/XP/2003/2007. MPEG Layer-3 (mp3) compression is used for recording. It allows to create small size files (1sec 1KB) with a high quality. emBoot's boot agents for Virtual Machines are client-based 'virtual' firmware that allows VM client created with VMware and Connectix (Microsoft) to do a 'network boot' using the virtual NIC. Real Estate Contact Management software is tightly integrated with Microsoft Outlook so it makes managing your client base simple and efficient. Kernel for Word is the most efficient software to repair Microsoft Word file that is corrupt, damaged or inaccessible. When you are typing in Microsoft Word, the program automatically completes the words considering the first letters entered. Our efficient Microsoft BKF Recovery Software at the present completely supports to repair and recover MS BKF data, files/folders and other important official document is created using with NTBackup Exe of Microsoft Windows and VERITAS Backup Exec of Symantec Company. 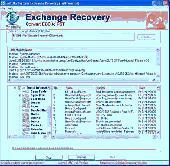 Software easily helps you in the crisis of BKF data loss. There are many unavoidable reasons for BKF data corruption. A common reason is the exceeded limit size of NTBackup. This leads to corruption of BKF file and in turn data loss. Export Exchange to PST with in few steps with Microsoft Exchange to Outlook conversion software. Select multiple EDB files for conversion at the same time & migrate all of its object like: emails, contacts & more with Exchange to Outlook converter.